Director Park Heung-sik new feature which he wrote with Choi A-Reum is a complicated drama involving legendary swords, war, revenge, martial arts, wire-work choreography, love and dysfunctional families. While the layers of intertwining relationships seem to spin one's head, the visuals are beautiful. Not only the photography of the landscape, the set decorations, but it has a wonderfully attractive cast which includes Lee Byung-hun which will be recognizable to American audiences from his roles in Transformers and Terminator. The story is about a young woman Hong-ee (Kim Go-eun) who has been trained to fight all her life by her mother Wol-so (Jeon Do-yeon) who is blind and runs a Arabian tea house. Hong-ee is eager to use her skills and challenges Yull (Lee Junho, singer in the Kpop idol band 2 PM), the winner of the General's combat arena. 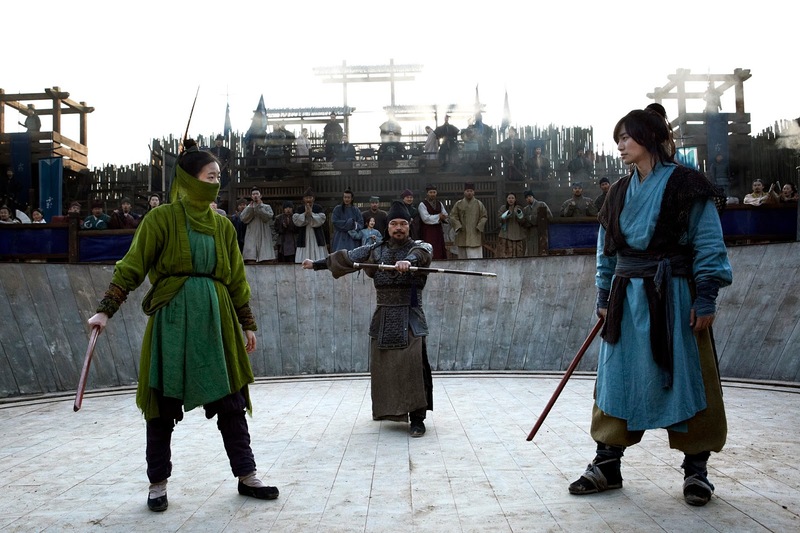 The General Yoo-baek (Lee Byung-hun) recognizes the footwork and style of Hong-ee's fighting. He follows her to ask about her master. When Wallso discovers Hong-ee has exposed her skills she decides it's time to tell her the truth. Wol-so was once part of a peasant uprising fighting with Poong-chun (Bae Soo-bin) and Deok-gi. They were known as the Three Great Swords with superior fighting skills taught by their master (Lee Geung-Young). They believe they won the war, but when the confronted the Governor, a tragic betrayal occurs. Deok-gi lets greed and ambition sell out his friends. Seol-rang who is now known as Wallso was in love with Deok-gi and saves him. She carries her guilt for the rest of her life by training Hong-ee to take revenge on those who killed her father. Seol-rang tells her that Yoo-Baek was once Deok-gi. Now he's become a famed general and the other members of the King's court are maneuvering to assassinate him. He manages to stay one step ahead. His ultimate goal is to take over the country and throne. But he's still carrying a torch for Seol-rang. The sword battles and wire work is nothing new. But it's still intriguing with everyone's secret past and the constantly changing identities of Hong-ee. You can probably figure out what is what, but it's fun getting there. Lee Byung-hun is great as the cold and calculating General Yoo and his heartbreaking love of Seol-rang. Kim Go-eun who won the 12th New York Asian Film Festival Rising Star Award is great as the young woman who is faced with a violent destiny. Jeon Do-yeon in her third collaboration with director Park won the 2007 Cannes Film Festival Best Actress award for Secret Sunshine. She wrings the tears for her guilt filled portrayal of a love gone wrong. This Well Go USA film opens on Friday, August 28 in Dallas at the AMC Grapevine.